I’m a little too tired, busy, and tired to make a proper post. 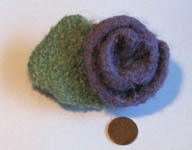 However, here’s the alpaca rose, before and after felting. The leaf didn’t felt down nearly as much as it did last time I made one. 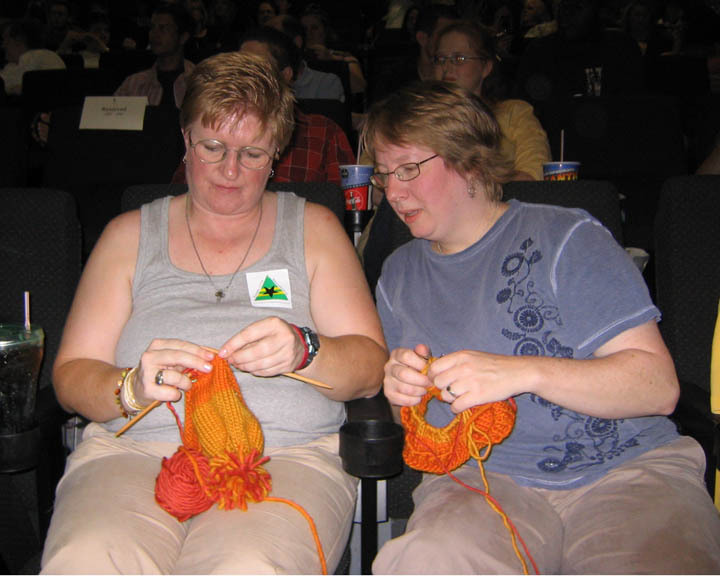 Maybe I cast on fewer stitches last time. Hm. I need to stitch the rose to the leaf more firmly, and attach a pin back. Emily is really putting the screws to me, sibling-wise. For the last two days, it’s been nearly constant “I want a baby sister.” Then she conceded that a baby brother was okay. I’ve been telling her that it’s just not going to happen, so she got clever and said I could adopt one. 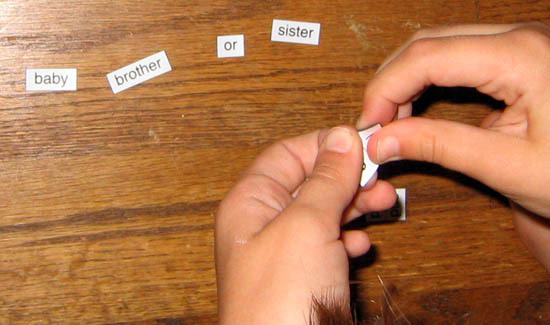 She found a set of magnetic kid poetry words that we’d been hiding to dole out later. Note subliminal message. Nice try, kid. I think she’s just wanting someone to play with. Her camp this week only lasted four days, and was very chaotic and noisy, so it wasn’t really a good way to make friends (not really her strong suit anyway). I’m going to call the mom of one of the other girl scouts and see if we can go get ice cream together or something. I also want to clean the house more so I’m more comfortable having people over. Not that I know whom we’d have over. Just tired. And a little down. And hungry. Mostly tired. But there’s an Office marathon tonight, so we’ll watch that and maybe order take-out that we really shouldn’t, try to get to bed at a reasonable hour, and then it’ll all be better. Emily’s going to Vacation Bible school at a very liberal Baptist church (liberal is good) this week, thanks to my mom’s gracious sponsorship. I asked Emily today if she heard any stories. Wow. Let me tell you, it was quite the story. Apparently Mary and Joseph had to find the wise men. Then Mary and Joseph built the wise men houses out of straw, sticks, and bricks. Then the houses broke, so they had to live in the “manger scene” with Mary and Joseph (I imagine this part of the story as a wacky sitcom). Then the wise men took the angel to a playground. It reminds me of when she told us Noah sailed on the Nina, the Pinta, and the Santa Maria, but two of them sank. 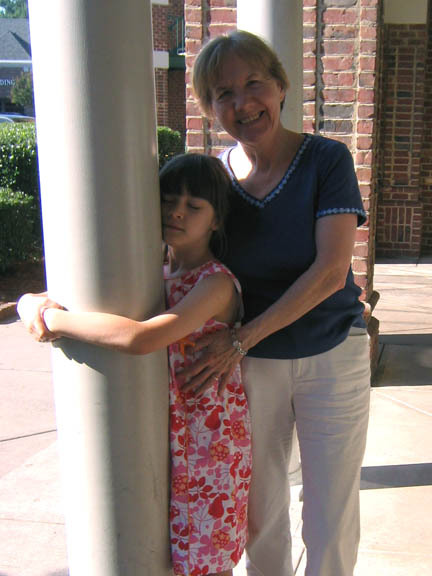 I knew Mom’s church was liberal, but c’mon. (I kid, Mom!) Good imagination on this kid. Here’s an artist’s interpretation of Emily’s new doll, who has apparently been demoted from Elizabeth’s sister to her friend. She’s also turned from redhead to blonde. 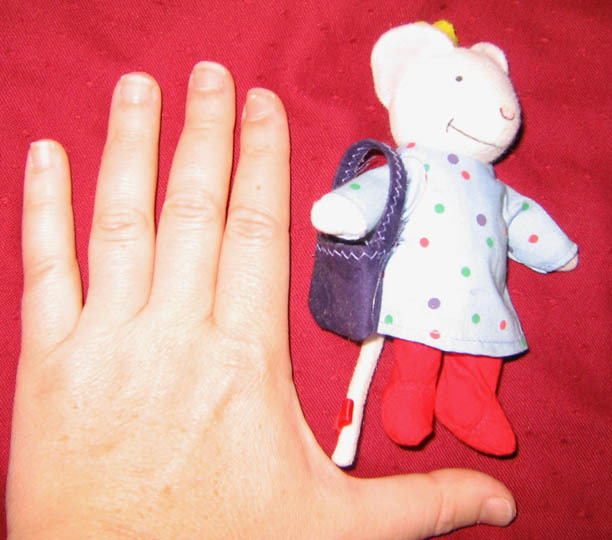 Emily told me that she wants to take the doll to the beach, so now I’m on deadline. The two pieces of the head are done, and I’m making a leg. Dr. Frankenstein’s got nothin’ on me! Today I’m calling around to various nearby cities to see who’s got more of my yellow. I’m perilously low (that’s a very old pic), and the order I placed to the mill won’t be ready for another couple of weeks. I could have made it if I hadn’t made the extra charity hats, but that was my call, and I’m glad I did it. It makes me happy to think of them out there, and it did seem to raise a fair amount for Equality Now. 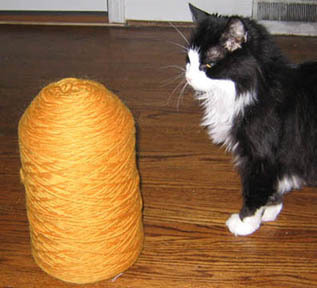 So I’ll be sweating a little today while I try to get my mitts on more yarn, but it’ll all work out. It always does! 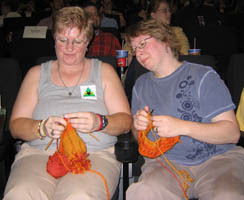 I’m part of sock_kit_swap, a group of LJ users who were, as the name implies, swapping kits for knitting socks. Packages are supposed to go out in the month of June. Well, today, I got a package from Canada. Eeeeee! My kit arrived! Pics and details under cut! Orders are up a little for Jayne hats, including one from a person who just missed winning a bidding war for the hat at the St. Louis screening. It’s not suprising that orders are up. However, if things follow the same pattern as last year, then orders will pick up more in about a week. What happens is that someone is dragged to the movie by an overenthusiastic friend, falls in love with it, watches the series, then wants a hat. A week or two is just about enough time for all that to happen. Tanya Morris, our event coordinator, reports that we sold 194 of 200 tickets, and that our screening raised $2600 for Equality Now. Last year we raised $479, so that’s quite a jump. Go us! The cards, by the way, were well received everywhere that I’ve heard so far. I haven’t heard from all the screenings yet, but I got a lot of compliments at the Charlotte screening, and Raleigh and another screening – I want to say Denver? – also wrote to say that the cards rocked. Good. Hopefully people will want to keep them. I’ve got a non-Jayne project going for a client. 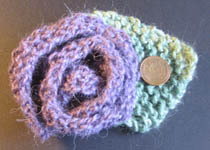 A felted purple rose like this one, but without the bee. It’s almost dry. It turned out well, I think, so we’ll see if she likes it. If not, eh, someone else will want it. I’ll post pics once I’ve got it nicely formed and attached to its pin backing. So apparently a very patriotic sister to Elizabeth is now on the knitting list. I should have just hidden the purple purse. Oy. Emily’s off at a morning camp, so I’m off to get a few things done before she comes home. Well, that was a blast! We nearly sold out the theater, and the preliminary numbers raised for Equality Now sound very good. I met a Greenville Browncoat who had one of my kits there. She was a fairly new knitter and wanted pointers on picking up stitches for the earflaps. 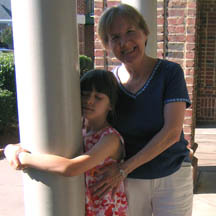 We went through it, and I showed her an alternate method that worked better for her. She picked it up (so to speak) quickly. 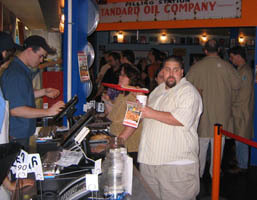 I went with Turtlegirl, Amy (whom I don’t think I’d really met), and who had never seen Serenity before. I realized this when at that big surprising moment in the movie – you know the one I mean – she gasped. There were at least 10 gasps in the theater, so that’s a good group of new recruits. Hearing the gasps reminded me of the time I saw The Empire Strikes Back when it was re-released in theaters. There was a girl sitting near us who, 25 years after the original release, had never seen the movie AND was completely unspoiled. One has to assume she was raised in the Amazon. In a cave. By wolves. During the Middle Ages. Regardless, it was so cool to hear her gasp in amazement at Darth Vader’s big reveal and whisper excitedly to the guy she was with. Really took me back to 1981. This was like that – you can never get back that moment before you knew what was coming, but you can still feel a certain vicarious thrill. In addition to donating a hat for the silent auction (it went for well above retail, thanks to that Browncoat for her generosity), I also loaned my mannequin for displaying an authentic costume from the movie. This nice young man carried it back to my car. He also gave me back my glass head used for hat display, leading to this exchange between me and . Illiane: Hey, want to see my new car? Me: Absolutely! I just got my head from this guy, let me go put it away. Illiane: A college guy gave you head? All right! Me: Yep. I’ve still got it. It went on. You get the gist. We were a little punchy. I imagine the young man would be appalled to learn of this conversation. His mother would, too, since I know her. 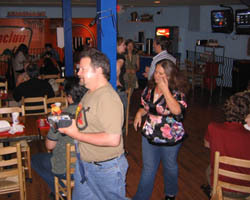 A lot of us met up at Fuel Pizza afterward. They very graciously gave our group vouchers indicating that they would donate a portion of profits from our meals to Equality Now. I heard the cashiers talking. They said they’d only been expecting about 20 people. Instead we took over the upstairs. So a good time was had by all, and it was a good haul for Equality Now, too. It was good for Fuel Pizza too, of course, since I know I had a good time and will go back, and I’m sure others will as well. All in all, it was a very successful evening. Once everybody’s rested up, we can start thinking about next year. Can’t stop the signal! 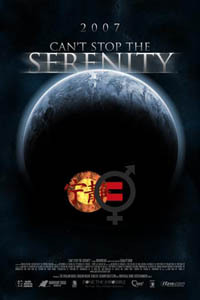 If you don’t already have tickets for your local Serenity screening, GET THEM NOW. Most places are having their big-screen showings tonight, and many of those locales are selling out. I’ll be at Charlotte’s tonight, at the Park Terrace theater. Seating begins at 7pm and the show starts at 7:30, but there’ll be check-in and activities from 6pm onward. Last I heard, there were fewer than 25 tickets left for a 200 seat theater, and they’ve stopped selling online. If you don’t already have tix, arrive early or take your chances! Great film, great cause. Highly recommended. Go. 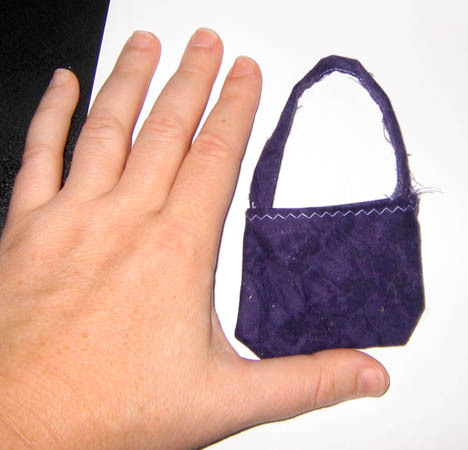 Emily and her purple purse. You probably didn’t know this, but is a talented seamstress who used to sell her beautiful handmade purses. She very kindly gave me the ritzy gold number to the right to pass on to Emily a couple of weeks ago. I held onto it until today since I’m trying to dole out the toys over the summer. 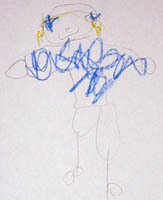 Emily was delighted to receive it. Thanks, Illiane! 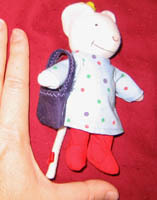 Getting this toy prompted Emily to dig out a little stuffed doll she had of Lilly, the mouse in the story Lilly’s Purple Plastic Purse. The problem with this is that she’d shown zero interest in this doll for quite some time, and the purse was gone. Of all the various tasks of parenting, number one on the hate parade is searching for small plastic pieces of junk toys. It causes my blood pressure to rise within seconds. Of course I don’t display this to my child, but you have to imagine cartoon steam coming out of my ears. We looked for a while, then I asked if I could just make her one. 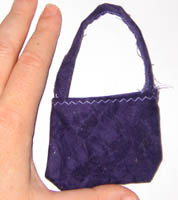 I had some purple fabric which Emily approved, so I fired up the sewing machine and knocked one out. I couldn’t remember the trick for turning a tube of fabric inside out, and my clumsy attempts with a crochet hook to snag the end and pull it through didn’t work, so the seam on the strap shows. 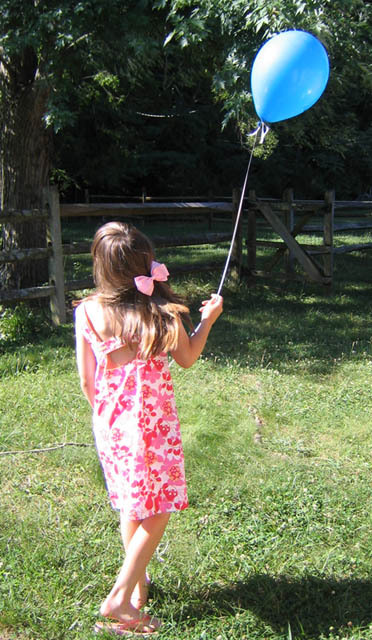 I gave it to Emily, who glanced at it, then without looking, set it at the edge of a table where it fell to the ground. She was busy doing something else. Le sigh. I asked if it was too big, and Emily said no, so I went off and took a shower. When I got out, Emily had taken the time to look at the purse more closely. She said that yes, it was too big, as I suspected. I got her to show me where she wanted it to fall on Lilly, then remade it. I was glad I hadn’t expended any extra effort to make that strap look nice. (Illiane, I need to get you to show me the strap-turny trick.) Emily said this purse was good. Then she put the doll aside and hasn’t picked it up since. Welcome to parenthood. Duration: LIFE. Souvenirs, beach anticipation, and blueberry muffins. I went out last night to buy a dress for Emily after realizing that she has none that fit her properly. I had asked her if she wanted to come along, but she said I should get her one and surprise her. Since I was at the mall, I decided to stop at the Apple Store. I went to the back of the store with my determined face on, which tends to deter kiosk vendors and over-eager salespeople. One guy, however, was very friendly and greeted me, so I smiled back and said hi. He looked familiar. He came up to me as I was pondering games, and said, “Aren’t you that Zork girl?” Aha! Yes! 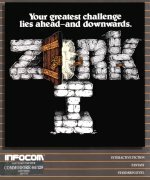 It was Zork guy! 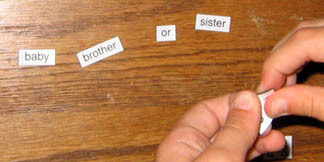 We reminisced again about text-based games and he said that I would forever be tied in his mind with that entire genre. I love that! I left him my card so he’d have a name to go with the Zork connection. He’s got a Windows machine now, so he’s going to try to download some and give them another shot for old times’ sake Nice guy, I like him. I did not, by the way, buy any games. I spent far too much money on my solo weekend, and I’ve got too much other stuff to do to really enjoy a new game anyway. Everybody’s asked if I was doing wonderful and wild things this weekend. The answer has turned out to be “nope.” Instead I’ve wandered around town doing things I wanted to (hence the spending too much money), and also taking care of a lot of errands like dropping things off at Goodwill, etc. I think there’s been some disappointment on some people’s parts because of that, but there shouldn’t be. It’s still a great break. 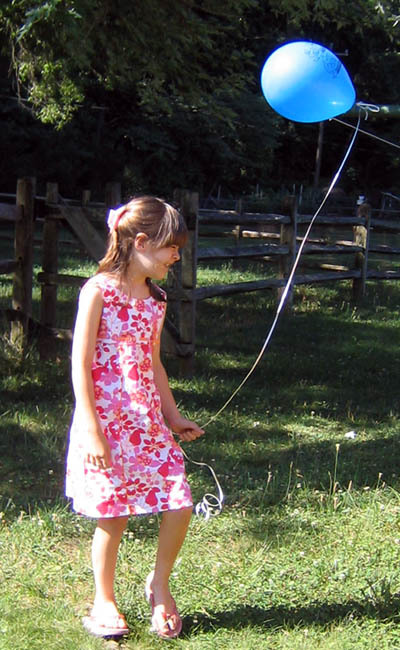 When I’m taking care of Emily, there’s a constant blanket of responsibility over my mind. Whatever I’m doing, I have to also have a process running in my mental computer that factors in how it affects my child. When she’s out of town, I don’t have to factor that in. The blanket is peeled off and more of who I used to be is exposed. I can stay up late if I want, knowing that there won’t be a little person stealing my bed at 6am. I can go to the video store and know that I’m free to browse as long as I want without a little person getting bored, or having to subconsciously keep constant tabs on her location. I can play my music loudly, even the stuff like Ike Reilly that has lyrics that are obscene. life is definitely different without my daughter around. Nonetheless, I’ll be very glad to have her back today.